Factual error: The cockpit voice recording is highly sensitive in nature. It would never be played in front of hundreds of people like in the movie. Factual error: The NTSB was portrayed horribly in this movie. They investigate purely on facts, not going on witch hunts like this movie implies. In the movie they tried to "second guess" and "blame the pilot." This never happens in real life. Continuity mistake: During passenger boarding the screen (Flight Attendant Panel), located above the forward flight attendant seats is a newer touchscreen one, but when flight attendants are doing safety demo, it changes to the older LED push button type. Factual error: In the flight deck scenes, one of the engine parameters displayed is "EPR." This applies only to A320s with IAE V2500 engines. The "Miracle on the Hudson" A320 had CFM56 engines, so the parameter should have read "N1." Continuity mistake: When Sully is checking the aft for anyone left, the flight attendant calling him has a red life vest on. When the camera zooms in as she leaves, she doesn't. When she jumps onto the slide she has it on again. Factual error: During the evacuation scenes there are several scenes where there are leaves on the trees. This happened in January. 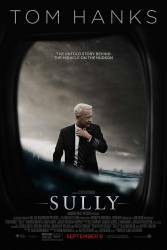 Factual error: When Sully approaches the airport vendor for a sandwich we see a souvenir orange New York license plate reading "Times Sq." New York didn't introduce the new orange plates until April 2010. Continuity mistake: When they are evacuating passengers onto the ferry boat, a crew member puts his hat on a passenger in a white shirt. In the next shot and when he says that he is cold he is not wearing a hat. In the very next shot the hat is back on. Factual error: The movie showed the FAA HQ building. Then the next shot showed the NTSB Public Hearing Room. The NTSB is actually located around the corner in DC from the FAA. They are not in the same building. Factual error: In a scene where Sully is walking through down town NYC in between yellow cabs, one of the cabs is a 2015 Toyota, but the movie is set in 2009. Factual error: The Space Shuttle Pavilion on the Intrepid is visible in the movie. Enterprise was only transported to the Intrepid in 2012. Factual error: When Tom Hanks is running through Times Square you can see the sign for the musical Aladdin which opened on Broadway in 2013. This movie is set in 2009. Factual error: When the A320 taxies out from LaGuardia there is a Continental airlines jet with scimitar winglets. These were not on commercial aircraft in 2009. During the several scenes where the pilots are communicating with Air Traffic Control, they are always addressed as flight 1549. During the real incident, however, both the pilots and controllers misspoke, labeling the flight number as both 1529 and 1539. This was likely due to the intensely stressful situation.